Last Monday, we started the final race of the TALL SHIPS CHALLENGE(r) Race Series outside of Duluth, MN. The race across Lake Superior had some of the best sailing of the season and the results will be announced at Tall Ships® Erie next week. Thank you to the Chicago Yacht Club for their help at the race start! I see red. The dried blood red meant to inspire fear at the site of Draken Harald Hårfagre and sense of aggression, anger, hostility, and danger sends a shiver up my spine. As I step onto the Viking vessel with the dragon carved into the prow, her centrally placed mast with a single square sail, and her decorative shields covering her graceful “clinker” style hull I feel empowered with strength, stealth, and vigor. I am in love. As a boy, I have always fantasized sailing in a Viking ship. Illustrative pictures in storybooks or cartoons have always romanticized the profile this ship has, and I feel fortunate for the opportunity to sail on the Draken for Tall Ships America, most likely her last voyage in the Great Lakes. She bravely crossed the Atlantic Ocean with her expert and cheerful crew to show us one of the finest artistic and constructed tall ships in the fleet. 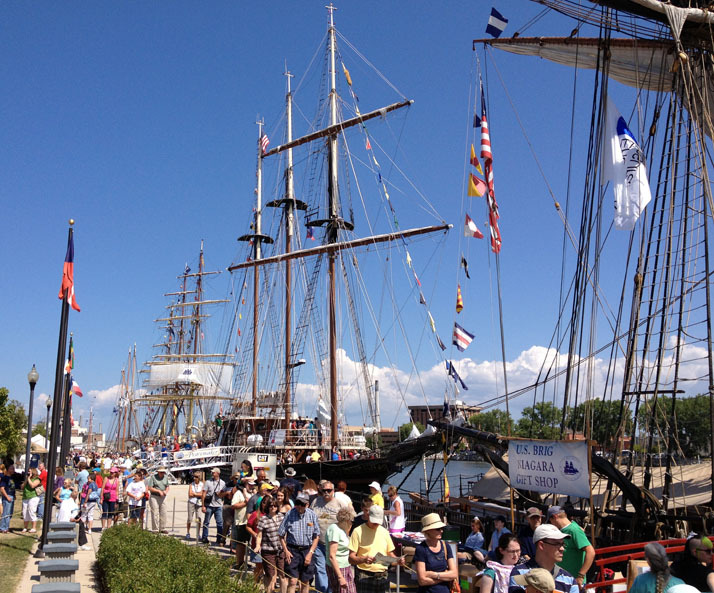 We’re featuring our fleet of vessels that you can see, hear, and touch when they come to your host city this summer as part of the TALL SHIPS CHALLENGE® Great Lakes 2016 Race Series. The Alden schooner was built in 1939 in Maine and remained in the Patton family until the 1970s when she was sold to a Landmark school in Massachusetts. In 1994, she was relaunched and remained in private hands for the next 20 years, racing in various classic yacht regattas. In 2012 she was extensively restored and now is open to the public. Denis Sullivan is the only replica of a three masted Great Lakes schooner in the world. Right now, they have a crowd sourcing campaign underway. Click here to help them meet their goals and learn more about their programs. The ship is a goodwill ambassador for the State of Wisconsin and is owned and operated by Discovery World in Milwaukee. From her homeport, the schooner offers educational day sails and private charters for people of all ages from May through September. The programming is committed to re-establishing the historical, cultural and environmental bonds between the community and one of it’s most valuable resources, the Great Lakes. Monday morning broke aboard the ship, the regular crew started trickling out, and strangers started appearing on the gangway. Myself, a Chicago sailor from aboard the Red Witch, and the cook from El Galéon Andalucia. It was an interesting start. The race continued into the afternoon and through the evening, and unlike many of the last races, the fleet seemed to group up as the race progressed, rather than growing further apart. Despite the schooner’s upwind advantage, it took most of the evening to finally pass Niagara, and most of the night to finally come abreast of Pride of Baltimore II, only to have them pass us with the wind shift. Wednesday bloomed hot and humid, and the 20 knots of southerly wind that had been promised turned into something only a little bit better than a doldrum out of the southwest. We sweated through constant gibes and sail changes, and finally resigned to putting up an awning over the aft section to try to relieve ourselves from some of the torrid heat. The captain came on deck to find several crew members lounging on the cabin top, glorying in our newly-made shade. Through the light winds of the previous day and evening, all the talk aboard had been of how to maximize the schooner’s sail area. We’d had a main gaff topsail, a small sail that closes the gap between the gaff of the mainsail and the main topmast. We’d even taken the small sail out of the ship’s dinghy and sent it aloft on the foremast, a crude imitation of the same technique. It was also something of a sore topic for the original crew. In their haste from Bay City, they had neglected to bring aboard their fisherman sail– a large auxiliary piece of sail that goes up between the masts on traditionally-rigged schooners. With the wind on our quarter getting lighter, every inch of canvas raised meant more speed, and quicker relief from the oppressive temperature. Niagara had gone so far as to leave its cutter outboard of its rail, but with its sail raised in the hope of catching that much more breeze. Now it seemed our captain wanted to do them one better. After a good deal of finicking, we’d come up with a jerry-rigged square sail. Captain Christopher affectionately christened it the fore-course, but the oblong rectangle that hung from the foremast was nothing short of ridiculous. Sarcasm is the sailor’s constant companion. It is his friend in all things. It gets him through the day, releases his anger, distracts him from his hunger and fatigue, and above all, gets him through these little bits of ridiculousness that pervade his profession. However much we tease each other, we tease landlubbers more. One sailor I knew after being asked if the Chicago water intakes in Lake Michigan were floating circus tents went on to regale his passenger of the elephants and clowns he had seen the night before. So it might have been funny to see a group of grown men putting up what amounted to a sun umbrella for a sail. Laughing about its size and shape and making as if to go below, gather shirts and sheets and start sewing new sails. But don’t laugh — that stupid sun umbrella got us a half a knot of speed! We are on Playfair, a brigantine that is the only ship to be commissioned by a reigning monarch, Her Majesty Queen Elizabeth II. Playfair sails under the Canadian flag. It is a great feeling with all hands on deck, everyone is busy, the wind softly cooling, the sun on your face, and knowing there is a destination but not knowing when you might make it. You’re not worried about this, you’re just happy to be part of the crew and have something new to do. On a tall ship you learn that you don’t need much to feel content. We help Playfair sail herself; the wind is in her sails and the crew at peace with her smooth sailing, she makes us all feel like skilled sailors. We are working together for success and as we work together in close physical boundaries, we socialize. We find that we are all passionate about our work and, even though we are all doing different jobs, we find that our goals are the same. 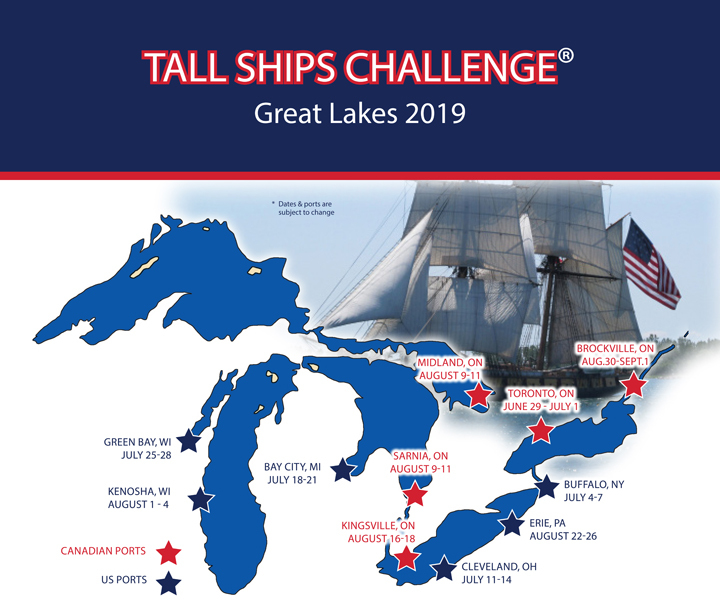 We just finished the race from Bay City, MI to the Straits of Mackinac around Bois Blanc Island with Playfair finishing second in the TALL SHIPS CHALLENGE®. Working together successfully calls for some maritime merriment. We have five days before we have to be in Chicago so our captain, Colin Burt, manages to sweet-talk his way into free docking and bathroom and shower facilities for us on Mackinac Island. My home is in Chicago but in my free time I am a Michigander. My family spends a good amount of time vacationing in the UP (Upper Peninsula) at our family farm. Mackinac Island connects the upper and lower parts of Michigan and I have never been able to fit a visit in. I find that I am just as excited about docking as the crowds are in the marina from the surprise visit of couple tall ships. We dock-up next to the Pride of Baltimore II and the crew begins buzzing like busy bees to tidy up and make Playfair orderly and looking its best. This job was compounded with endless questions from people walking the pier. The crew is pleased to share their adventures in sailing and knowledge of the ship to the delighted visitors. With our curiosity to go ashore at bay, we entertain the crowd as we tell our sailing stories with pride and pleasure. A hot water shower is a precious commodity on a tall ship and as we go ashore on Mackinac Island the crew races for the opportunity to be the first in the shower. As in sailing, the not knowing how long it will take to get to a destination, it is the same with a shower; not knowing how long the hot water will last. Free to roam and explore the island we find it to be a unique scene. There is a lot of action but in a Victorian style. We hit the shops for personal items, souvenirs, and, of course, the fudge and ice cream. I ended my day watching the sunset on the shore with the Mackinac Bridge in sight. I am thinking of my family hoping the wind and waves are on our side as we navigate to Chicago for the Navy Pier festival. Even if is it is only for a few days, I’m going home! We are catching up with the intern’s adventures throughout the summer. 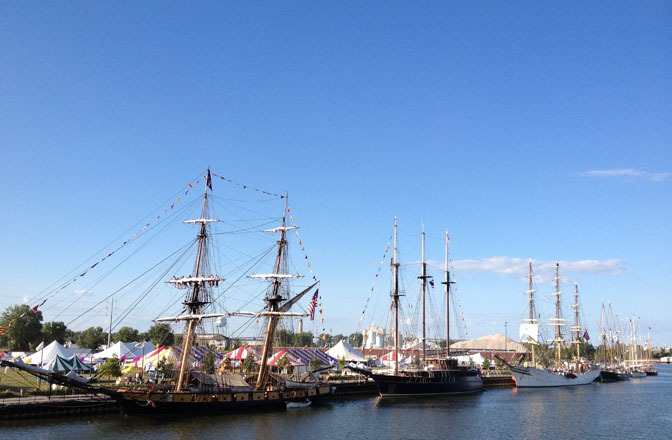 Last week, they were at the Pepsi® Tall Ships® Chicago 2016 and this week we are at the Tall Ship® Festival presented by Nicolet Bank in Green Bay. Ben raced out of Chicago on Appledore IV and George sailed up to Sturgeon Bay aboard Draken Harald Harfagre. They will both be sharing their experiences here on the blog. From Chicago, Patti and I headed up the Door Peninsula to help out with the Parade of Sail into Sturgeon Bay where some of the ships were berthing prior to their arrival into Green Bay on August 16th. 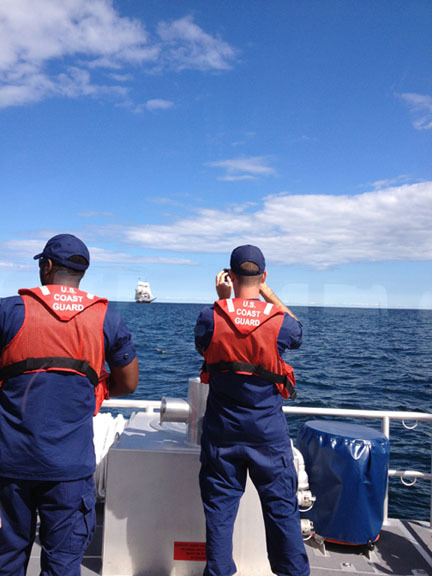 Once again, I got to hang out with some Coast Guardsmen on a wicked fast small boat, making sure that spectator boats stayed a safe distance away from the ships as they made their way into the Sturgeon Bay Canal and through the three bridge lifts required to bring the ships into town. It was another gorgeous afternoon spent out on the water, playing around on boats. After Chicago, our fleet split – Friends Good Will, Lynx and Madeline headed to Collingwood, ON and Playfair, Pride of Baltimore II and Liana’s Ransom headed to Owen Sound, ON as part of the 1812 Tour presented by Redpath. Meanwhile, Appledore IV, Hindu, Niagara, Peacemaker, Sorlandet, Unicorn and Windy joined us in Green Bay. With excellent volunteers and liaison officers, live music every night and an amazing turnout, we had ourselves a wonderful time in Green Bay. The event also featured the longest lines I saw all summer! It felt as though there were too many goodbye’s in Green Bay. It was our last event with Brian, who headed back to school in Utah once the ships departed. 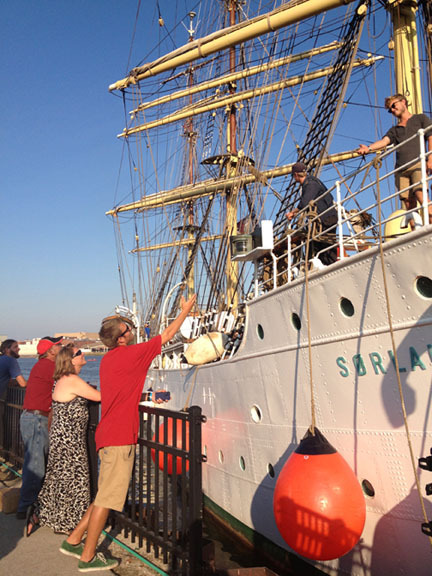 We also said goodbye to the crew of Sorlandet that had been with us since Cleveland. The ship sailed to Collingwood to pick up new students for the Class Afloat program and to switch out the crew. This new crew would take the ship out of the Lakes and across the Atlantic Ocean. It felt too soon to be making promises of future sails together, invites to visit “if you are ever in the area”, and getting one last hug in before the horn sounded and the ship made her way slowly down the river.